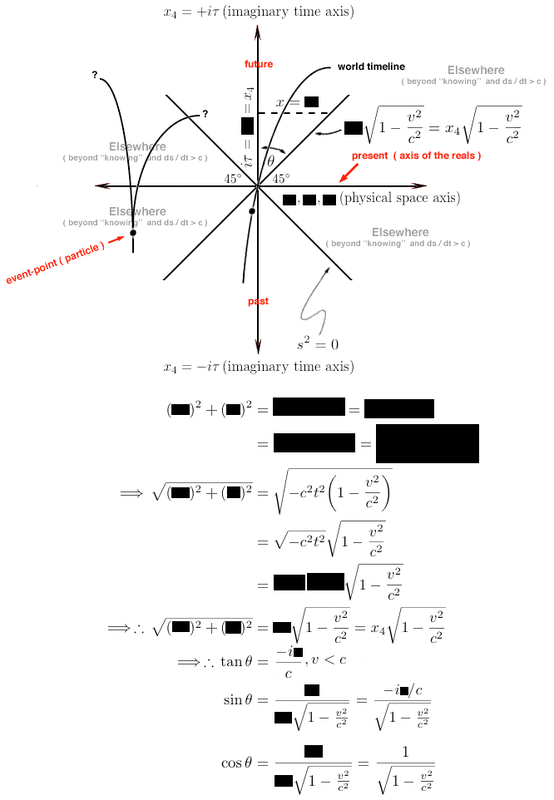 note: That is, proper time is the clock time of the light cone photon measured by an observer moving coincident with the light cone photon in the photon's own frame of reference, system, located precisely on the moving surface of the light cone for the existential immediate present time, . In this sense, we all live in this immediate existential present time on the surface of a light cone bringing to our senses information about the external world and therefore any clock [ or watch ] attached to ourselves is measuring our own personal and private proper time. Mathematically, therefore, the above equation for proper time is saying exactly this, which is one more way of saying that we humans live in an existential "light cone of knowing". 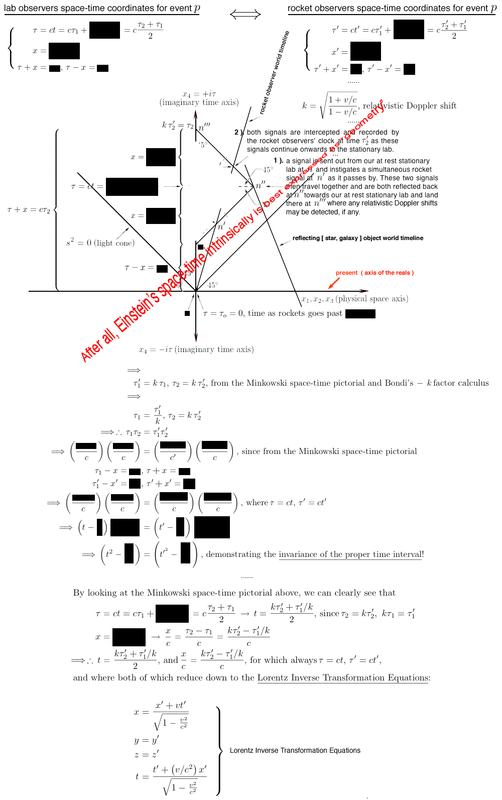 The author of this Relativity Physics and Science Calculator page knows at this time that both the geometry as well as the mathematics of this geometry is getting a bit hairy, however, still, an attempt is being made here to demonstrate in Euclidean geometry and in visual picture the development of 4 - dimensional special relativity mathematics! So stay with it for a bit longer! It will all come together, have faith. Only a light pulse can be present spatially and temporally ( time - wise ) at two events simultaneously. And this can only occur on the surface of the light sphere given by . That is, the proper time interval on the surface of a light sphere occurs between the transmission and reception of a light pulse which, by the physics of the light sphere, is zero. 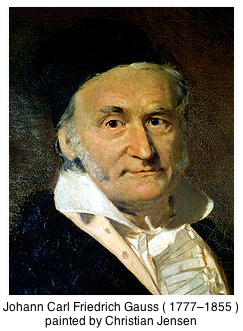 The pseudo - Euclidean geometry of Minkowski had previously been made possible by the earlier mathematical "theory of surfaces" of Carl Friedrich Gauss ( 1777 - 1855 ), brilliant German mathematician, whereby imaginary numbers, , are to be treated in Cartesian curvilinear coordinate systems as perpendicular to those expressing real numbers for physical distances along a curvilinear coordinate axis. That is, multiplication has the geometric interpretation of a 90° rotation in Euclidean - Cartesian space. In fact, Gaus's mathematics opened up the mathematical possibility for Riemann geometry in the general postulate of relativity - i.e., Theory of General Relativity Physics. 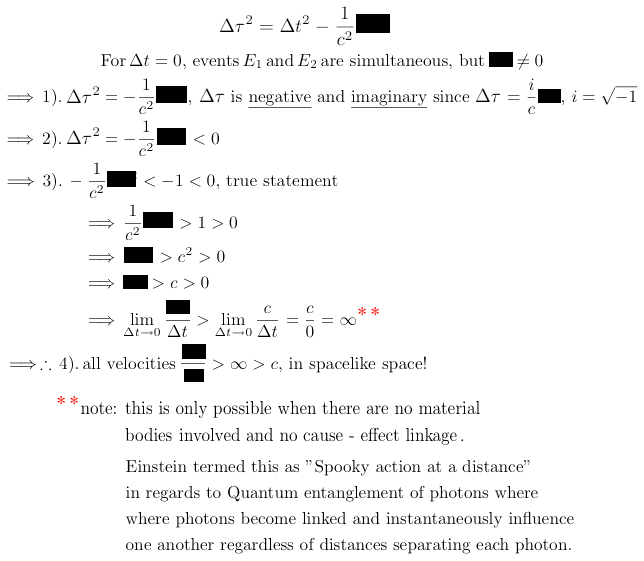 Notice, also, the event - point ( particle ) in Elsewhere Space ( '?' ) which may or may not affect both human "knowing" as well as having an effect upon the known human external world. Astrophysicists understand this experience all too well when suddenly some distant star or galaxy bursts into view; and, also, comprehending all too often what Rover is transmitting back to earth from Mars is delayed information so that never can earth observers know what is occurring "now" on Mars or elsewhere in the universe owing to the finite speed of light which defines the limits of the Minkowski Light Cone of Einstein's spacetime. Mathematics and the physics of the external world to which it attempts to best explain nature in terms of symbolic logic, is the human mind's premier tool for understanding external physical reality. Yet, admittedly, mathematical physics will always be a work-in-progress for discerning "ultimate truth", whatever that is. Therefore insofar as Einstein's spacetime relativity physics mathematics and Minkowski's spacetime geometry are concerned in describing external physical reality, we are now more intellectually informed than from any previous period in human intellectual history that as any body or object travels at a significant fraction to the speed of light, the body itself will be significantly "twisted" or rotated in the geometry of spacetime! In other words, the body or object will undergo spacial rotation and time dilation ( expansion, units of time expand ), both of which will be manifest in the deformation of the geometry of spacetime. This result is actually quite amazing, notwithstanding defying ordinary common sense. 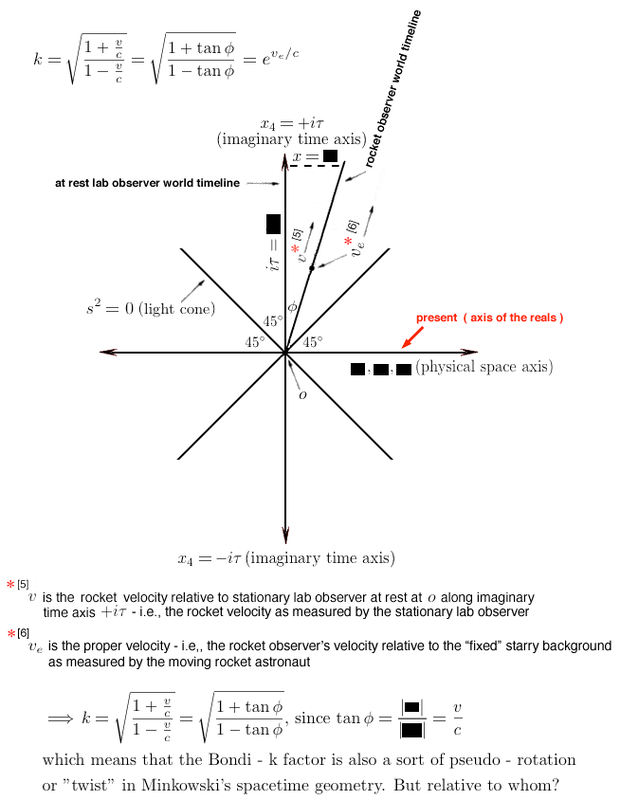 That is, as velocities significantly increase, the geometry metric as to what constitutes a unitary measure of space - distance is altered and the physical axes of direction comprising the inertial ( non - accelerating ) frame of reference are rotated as well as what constitutes a unit measure of clock time is dilated; all of which is demonstrably shown by Minkowski's light sphere of geometry!! More philosophically, our human perceptions of external reality can tell us only a limited amount of truth regarding the external world. At a deeper level of understanding, therefore, it is only by means of philosophic and mathematical inquiry that an observer in and can relate their "experiences" to each other beyond what their respective naïve perceptions will tell them. To the observer in there is one sort of angle of velocity motion but to the other observer in there is another, but different, angle of velocity motion, whereas neither would realize that their respective angle of velocity motion differs from the other except by a deeper noumenon of philosophic and mathematical inquiry. Conclusion: Euclid is therefore wrong: there is no such thing in nature for absolute straight ( or parallel ) lines at significant fractional velocities approaching the speed of light!! 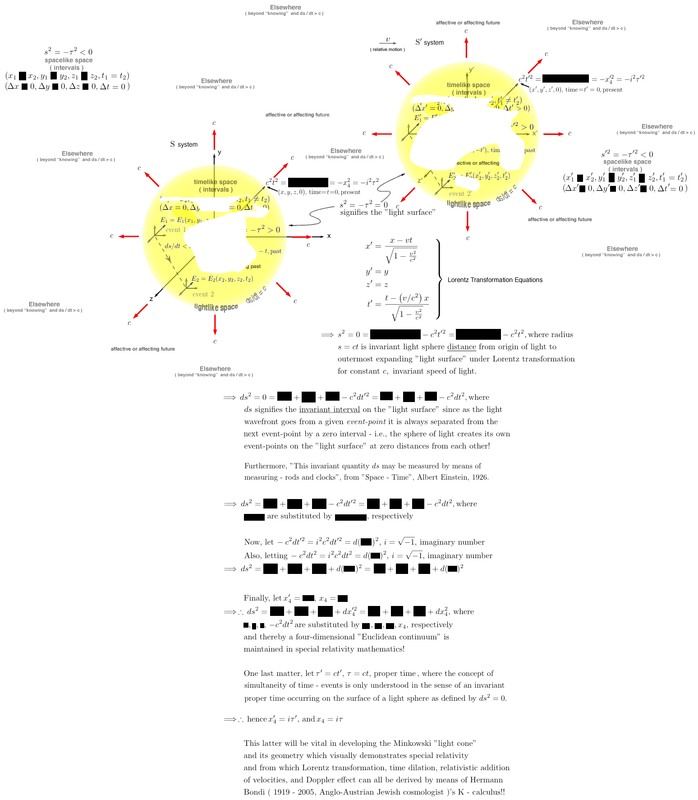 See: "Relativistic Velocity Transformation Equations" for an example of this phenomenon. Hermann Bondi's K - Calculus is initially predicated upon imagining a rocket going off from a starting point in time and space identical to a stationary lab with synchronized time and then taking the mathematics of this situation in terms of comparing the observed time back at the stationary lab and on the moving rocket. Also thrown into this situation is a 3rd moving observer with relative velocity to both the moving rocket and the stationary lab. 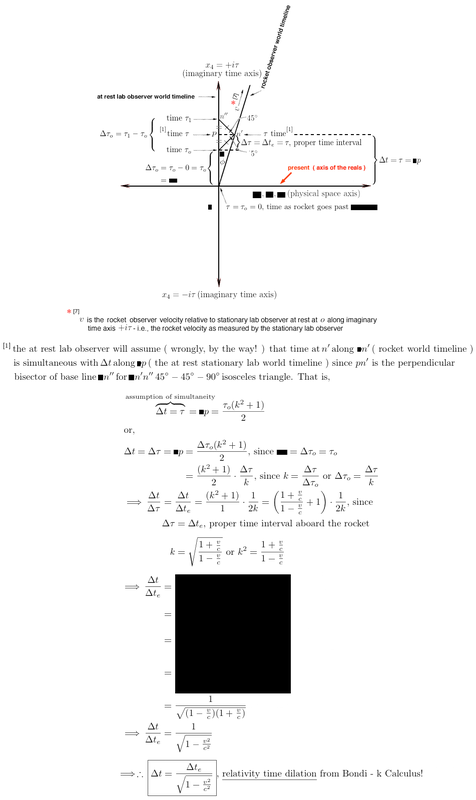 Finally, the 45° degree angle is put into this mixture simply because this is the geometric angle between an axis of space and the axis of time of communicating to and from the lab with the rocket as has already been shown by Minkowski's space-and-time geometry for traveling light and other electromagnetics. This is just simply the nature of our external world of having a finite speed of light and other electromagnetics - i.e., we humans live inside a Minkowski cone of light. 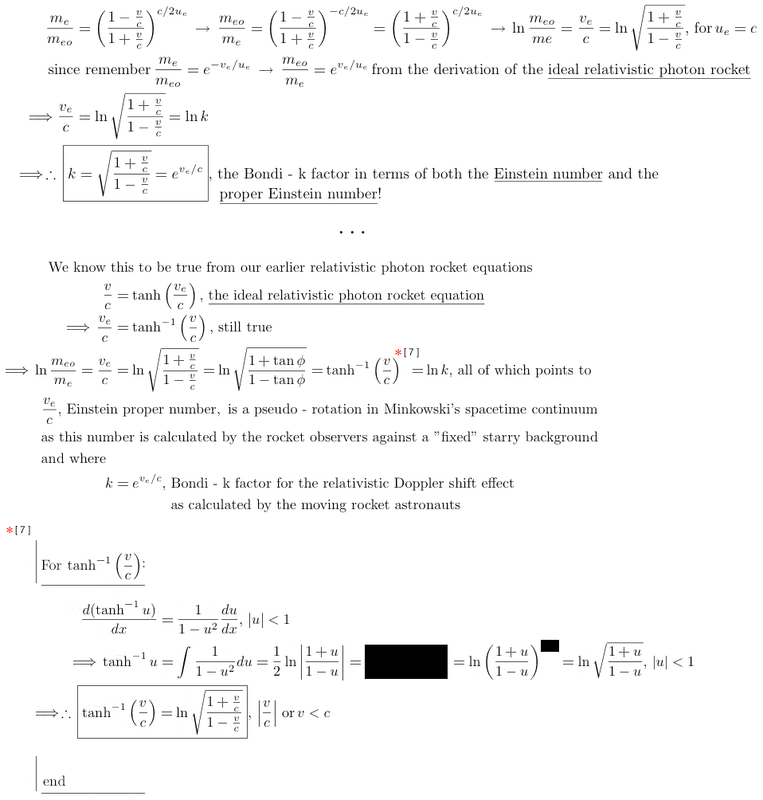 More explicitly, this Bondi - k factor Calculus using Minkowski's geometry is made further clear by assuming that upon receiving a light signal from the stationary lab at rest along their world timeline, that the rocket observers immediately re - transmit this light signal back to the stationary lab observers. So, the lab light signal goes from to at the rocket and immediately on to back at the stationary lab along their world timeline. Here now is the Bondi - geometry with the 45° degree isosceles triangle and this following Theorem for Isosceles Triangles: "The altitude to the base of an isosceles triangle bisects the vertex angle and is perpendicular to the base". For the final derivation of both the above Lorentz Inverse Time Transformation Equations as well as the Lorentz Time & Length Transformation Equations based upon what has just finally ended, please click here. Ah, so you thought that you'd be left without these final 'time - length' derivations? Never! Because light travels at a definite finite speed, not everything is known about the universe nor can it be known. The area beyond human knowing is called in cosmology "Elsewhere". Contrariwise, if the speed of light were instantaneous or speed == infinite speed, then human knowing of our external world ( universe, cosmos, whatever you want to call it ) would equally be instantaneous and totally all encompassing, at an instant of looking. Newton and Galileo thought it was. But it's not. The specific geometry of showing this "Elsewhere" comes from the simple trigonometric tan of the angle between the ( vertical ) imaginary axis of time that Einstein and Minkowski created on a 2-dimensional sheet of paper with the horizontal axis depicting one of the axis of our ( obvious ) physical world -- you know, height, length and width or x, y, and z. The intersection of these couple of geometry lines on a 2-dimensional sheet of paper is our human present. At zero, so to speak. Now the tan of the angle of which was just written is v/c ... that is, the velocity of something such as a rocket or ourselves walking or whatever divided by the finite, yet definite speed of light. It just is, so accept it. But what happens if v equals c? Well, v/c = 1 and hence the tan of 1 = 45 degrees by simple Euclid geometry. Hence because the maximum speed possible in our world is c, therefore our human world of knowing is defined by this 45 degrees of light flashing outwards from the intersection of the ( vertical ) imaginary axis of time with any horizontal axis of our physical space -- e.g., we can hold y and z constant and then move along the x axis into the future from our immediate present coming from our past or vice versa. Whatever. 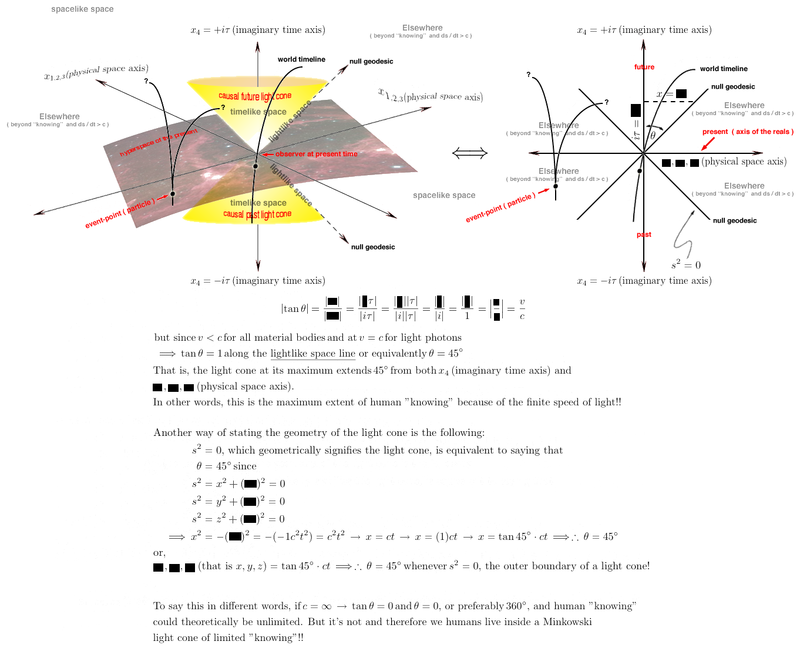 All of this just now describes the inescapable fact that all of human knowing exists in a so - called "Light Cone" or "Cone of Light" because 45 degree angle(s) precisely outlines a geometric cone of light!! In Quantum there is the Heisenberg Principle of Uncertainty; in Einstein special relativity there is the Minkowski ( Hermann Minkowski, 1864 - 1909, Jewish - German mathematician ) geometry for a "cone of light". See: Heisenberg Uncertainty Princple. "Elsewhere" comes into our human knowing whenever a star, galaxy or atomic particle suddenly and inexplicably pops into astronomical view for some [ lucky ] astronomer. 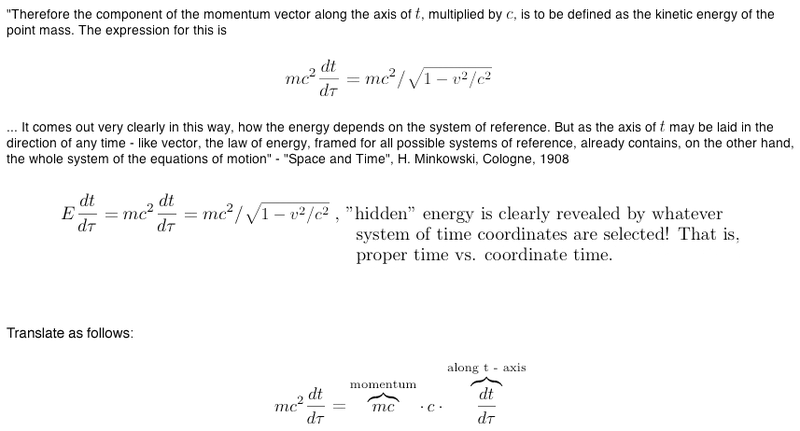 But perhaps Minkowski's greatest contribution to relativity mathematics was showing that inertial ( non - accelerating ) motion under Lorentz Transformation conditions with relative constant velocity v, is equivalent to a rotation or "twist" in a pseudo - Euclidean geometry system of 4 - dimensional spacetime coordinates! Finally, finally, along came Hermann Bondi ( Austrian - born 1919 - 2005, Jewish - Anglo mathematical cosmologist ) who devised a different type of calculus -- another sort of mathematical tool -- based directly upon Minkowski's geometry for special relativity physics which allows for a more visual geometric derivation of all of Einstein's special relativity physics mathematics. Now from the above Michelson - Morley apparatus in 1887, Michelson and Morley could measure wavelength ( distance from crest - to - crest or trough - to - trough ) for the ( interference ) light pattern and they could also measure the frequency ( inverse to the time of one wavelength ); hence, Albert Michelson and Edwin Morley could fairly accurately determine the speed of light!! Not perfectly, but fairly accurately. Actually, it's always the speed of light and not the velocity of light because light comes to our eyes from all directions and not from any particular unique direction. So it's speed of light and not velocity of light. However, the real point of their experiment is that while their apparatus is stationed on earth and earth is speeding thru space going around the sun in its orbit at 18 km per second! !, that for no matter in which direction their apparatus was turned on [ speeding ] "platform - earth" that their calculated speed of light was the same!! There was ( and is ) no ( invisible ) carrying medium called the aether to transmit light from one place to another and thereby either to speed up or slow down the measured speed of light. The speed of light as calculated by Michelson and Morley was hence a constant! A universal constant!! Actually it was Albert Einstein who first said that the speed of light is a universal constant in his reinterpretation of the 1887 Michelson - Morley Experiment. So ... Albert Michelson, an American Jew, was the first American to the receive the Nobel Prize in Physics in 1907 based upon this 1887 experiment together with Prof. Edward Morley, M.D. and Phd. chemical scientist. Albert Einstein published his "On The Electrodynamics of Moving Bodies" in 1905 wherein he incorporated the earlier mathematics of Irish George FitzGerald and Dutch Hendrik Lorentz which offered an exact mathematics but an inexact interpretation for the results of the Michelson-Morley experiment of 1887 but where Einstein's own special relativity mathematics penetrated much deeper into the actual nature of physical reality. Albert Einstein did not ever win the Nobel Prize in Physics for relativity; rather Einstein won the Nobel Prize in Physics in 1922 for the Photoelectric Effect! You know, solar cells, laser weapons, television, and so forth. See: Photoelectric Effect. Here's one last thing to think about: if the speed of light was instantaneous and not at a given finite speed, we humans could then "know" everything about everything instantaneously from the light that comes into our eyes! We humans would be instantaneously connected to the furthest parts of the cosmos in our knowledge of what transpires in the cosmos. Nothing would be hidden from either our view or our knowledge of the universe. But this is not true. In fact, we intelligent beings live in a "light cone of knowing" due to the fact that the speed of light is finite, even though at a universal constant. Actually to be strictly solipsistic, we humans exist - or rather glide along - precisely on this 45° "Lightlike Space" worldline!! This is called "Proper Time". And any ideas of "future" or "past" is strictly an invention of the human mind!! Which is ok since it allows us humans to manipulate the external physical and time ( spacetime ) world to the greater benefit of our own species survival. So, we humans as intelligent beings cannot "know" everything around ourselves at all times and for all places in the universe. Also, look at this fact of human existence this way: there are all sorts of magnetic and electric fields around us, practically all the time. But we only "know this" by turning on a television or radio in order "to know" this reality. Otherwise, we humans "know" very, very little about what surrounds us and, in truth, what affects us! Until we turn on the radio or television!! "The Meaning of Relativity", by Albert Einstein, Fifth Edition, copyright ©1956, by the Estate of Albert Einstein, copyright renewed 1984 by the Hebrew University of Jerusalem, Israel, Princeton University Press. "Space and Time", by Hermann Minkowski, A Translation of an Address delivered at the 8oth Assembly of German Natural Scientists and Physicians, at Cologne, September 21, 1908, Dover Publications, Inc. Here is a pdf English version and click here for the original version in German. Source: Jahresbericht der Deutschen Mathematiker-Vereinigung 18 (1909) pp 75-88. 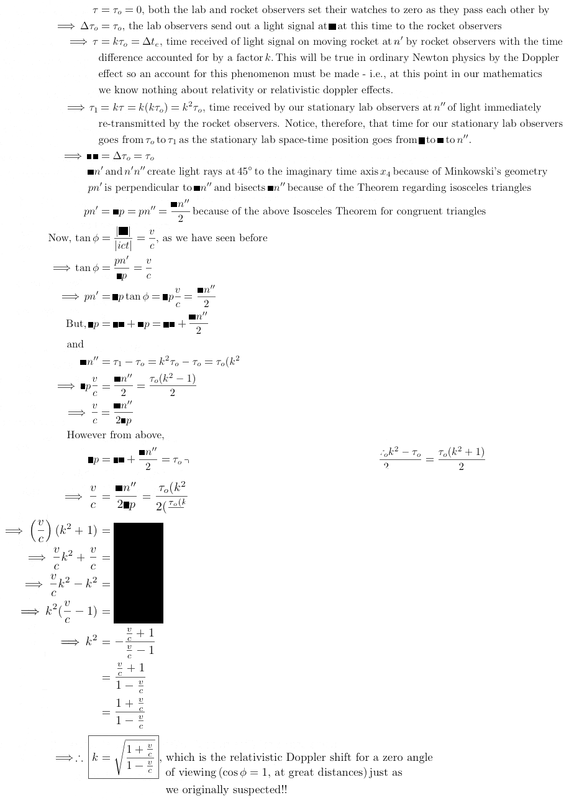 "Introduction to Tensor Calculus, Relativity and Cosmology", by D.F. Lawden, Emeritus Professor, University of Aston in Birmingham, U.K., Third Edition, copyright ©1962, 1967, 1975 by D.F. Lawden, copyright ©1982 by John Wiley & Sons, Dover Publications, Inc.
"Relativity and Common Sense, A New Approach to Einstein", by Hermann Bondi copyright ©1962, 1964 by Hermannn Bondi, republished 1980, Dover Publications, Inc.
"The Special Theory of Relativity", by David Bohm, A close Einstein colleague at Princeton University's Institute for Advanced Study, copyright © 1965, 1966 by Sarah Bohm. 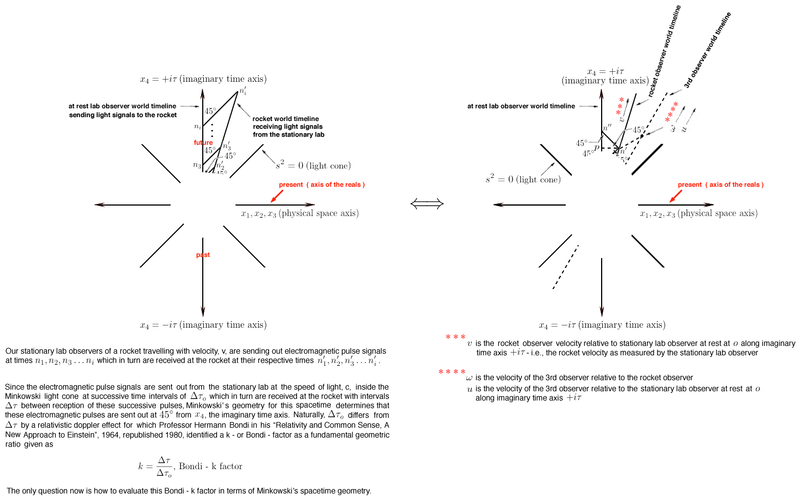 "Relativistic Flight Mechanics and Space Travel", by Prof. Richard F. Tinder, copyright © 2007, Morgan & Claypool publishers.